On Day 1 we pretty much worked on the rear end of the bike. 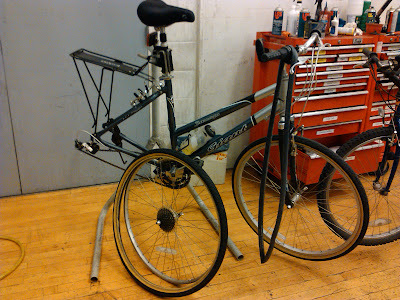 I removed and reapplied my rear wheel at least 30 times. I was proficient. I removed the wheel, pulled off the tire, deflated - re-inflated the tube, and learned the difference between schaeder and presta valves. (Consequently I have gone to MEC to buy a few valve converters and a new tire pump) . We learned how to break our chains (on purpose) and how to use a nifty tool to put them back together (need to buy tool). I learned how to fix a flat and how to use those 2 little wrench things that look like beer cap flippers - and why I do need 2). 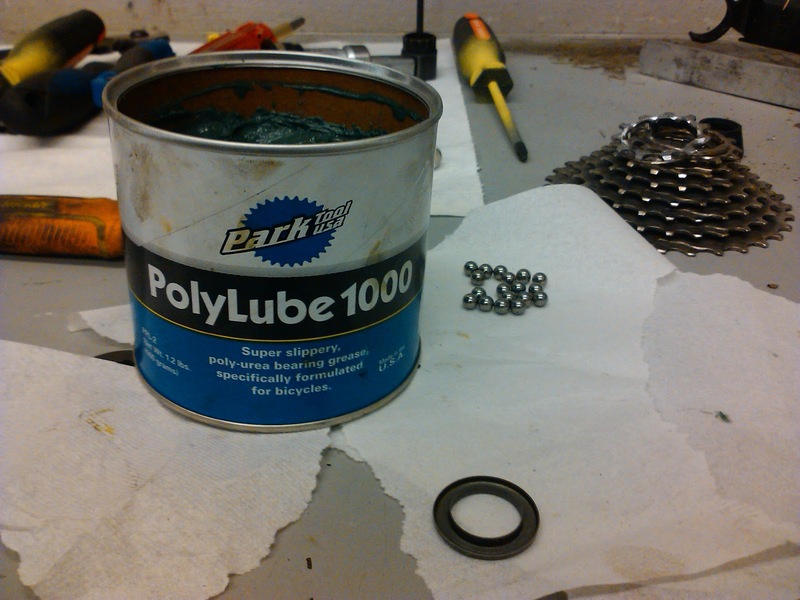 I did a "grease transfer" of the bike chain, gear sprockets, derailleurs, and the chain stay (that's CSI talk for all the greasy gritty sludgy crap on the bike was transferred to me). In the afternoon while everyone was replacing their brake cables, I was truing my rear wheel. Truing a wheel is an extremely zen type experience and once I got going with the little "tweek here" and just another little "tweek there" it was extremely difficult to stop. Day 2 - I was behind. At this point we were really getting into the knitty (oooops) nitty gritty. We pulled off the crankset (this almost killed me) disassembled the hub, removed, inspected, washed the ballbearings - degreased - regreased and reassembled. By midday I was constantly 3 steps behind in a 2 step process. I was desperate for a Venti triple ANYTHING! I longed for Day 1 where my only worry was "did I put my tire tread on backwards?" But I persevered, and by the end of the day I was back on my bike with a "Basic Bicycle Mechanic Certificate" in hand . Clunk-ity... clunk-ity ... aaahhh crap!